My sister has made this soup for us over the years, and it is a family favorite. I'm posting the recipe here so that I don't have to keep bugging her for it each fall, when the weather cools. Now I can just grab and go. We love the gentle spice from the ginger and the sweetness brought in from the corn. I hope you like it, too! Saute onions and oil in pan for 3-5 minutes over medium low heat. Add chopped red peppers and saute 3-5 more minutes. Add chopped garlic. Mix in dried ginger and stir well. Cook for 1-2 minutes more before adding 8 cups of broth, followed by coconut milk. Add salt, pepper, corn and stir. Let cook over low heat additional 30-45 minutes and serve. 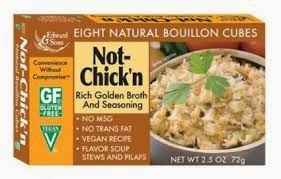 Of course you can use any broth in place of the Not Chick'n. This just makes for a very easy to put together and delicious soup when you are serving vegetarians who need a gluten free safe soup. Enjoy.